We are specialized in Reproductive Endocrinology & Infertility, which is a sub-specialty of Obstetrics and Gynecology. Therefore, we dedicate our time in performing reproductive medicine treatments and surgeries to overcome infertility. We are a sub-speciality of OB/GYN and therefore, we take care of all issues related to infertility. We are board-certified in OB/GYN and board certified in Reproductive Endocrinology and Infertility. We specialize in Reproductive Endocrinology & Infertility and are knowledgeable in treating all kinds of infertility issues. We dedicate our time in performing reproductive medicine treatments, such as IVF, ICSI, Frozen Embryo Transfer and surgeries to overcome infertility. Our Michigan fertility center is well-established and a long-standing facility located in Flint and Rochester Hills, Michigan. As of August 2016, for the convenience to our patients, we see patients at our Dearborn location and our Ohio location. Our infertility team provides patients with the utmost care and compassion. We are dedicated to our patients and provide them with the latest knowledge and research available in the field of infertility. Our Michigan Fertility Center offers low cost testing and procedures at our Rochester Hills facility. Our facility is accredited by the American Association for Accreditation of Ambulatory Surgery Facilities (AAAASF), and our infertility laboratory uses state of the art equipment to optimize results for our lab tests and procedures. Our team is dedicated to helping you achieve your dream of parenthood. The laboratory is inspected yearly by the College of American Pathologists. Our facility is kept up to the highest standards. We are an approved facility of the College of American Pathologists (CAP approved facility). In addition, our Michigan Fertility Center yearly reports the IVF data to Centers for Disease Control and Prevention (CDC) and to the Society for Assisted Reproductive Technology (SART). IVF MICHIGAN ROCHESTER HILLS & FLINT, PC. In addition, Dr. Abuzeid is an attending physician at the following hospitals offering surgical procedures for a variety of reasons. 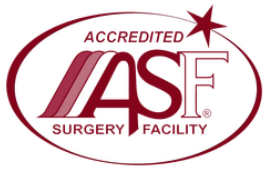 Our facility is accredited by the American Association for Accreditation of Ambulatory Surgery Facilities, Inc. (AAAASF). Our facility is accredited by the College of American Pathologists (CAP).